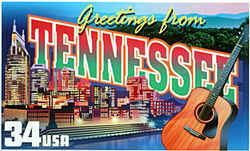 Take a peek at Tennessee history. Discover an overview of Tennessee's rich history, heritage, historic events, and culture. Tennessee's great diversity in land, climate, rivers, and plant and animal life is mirrored by a rich and colorful past. For all but the last 200 years of the 12,000 years or so that this country has been inhabited, the story of Tennessee is the story of its native peoples. The fact that Tennessee and many of the places in it still carry Indian names serves as a lasting reminder of the significance of its native inhabitants. Since much of Tennessee's appeal for her ancient people as well as for later pioneer settlers lay with the richness and beauty of the land, it seems fitting to begin by considering some of the state's generous natural gifts. Tennessee divides naturally into three "grand divisions"- upland, often mountainous, East Tennessee, Middle Tennessee with its foothills and basin, and the low plain of West Tennessee. Travelers coming to the state from the east encounter first the lofty Unaka and Smoky Mountains, flanked on their western slope by the Great Valley of East Tennessee. Moving across the Valley floor, they next face the Cumberland Plateau, which historically attracted little settlement and presented a barrier to westward migration. West of the Plateau, one descends into the Central Basin of Middle Tennessee - a rolling, fertile countryside that drew hunters and settlers alike. The Central Basin is surrounded on all sides by the Highland Rim, the western ridge of which drops into the Tennessee River Valley. Across the river begin the low hills and alluvial plain of West Tennessee. These geographical "grand divisions"correspond to the distinctive political and economic cultures of the state's three regions. Tennessee possesses a climate advantageous for people and agriculture, with abundant rainfall and a long, temperate growing season. The area generally is free from the long droughts and freezes of more extreme climes. The three major rivers that flow around and across Tennessee - the Mississippi, Tennessee and Cumberland Rivers - have created watersheds which cover most of the state. Tennessee River forms near Knoxville and flows in a southwesterly direction into Alabama, then loops back north to the Kentucky border. The Cumberland River drains northern Middle Tennessee, and West Tennessee is covered by a network of sluggish streams, swamps and lakes which flow directly into the Mississippi River. These rivers and their tributary streams have played a significant role from the earliest times by yielding fish and mussels, by serving as major transportation routes, and by creating the fertile bottom soils that attracted farmers. Fossil-laden rocks found across Tennessee attest to the fact that warm, shallow seas covered the state in the distant past. Coal-bearing strata of the Pennsylvanian period are present throughout the Cumberland Plateau. Plant and dinosaur fossils of the Cretaceous epoch occur in the sandstones of West Tennessee. Remains of extinct mammoths, mastodons and giant sloths, driven south by the advancing glaciers of the Ice Age, can be found in the Pleistocene deposits of West and Middle Tennessee. The story of man in Tennessee begins with the last retreat of the Ice Age glaciers, when a colder climate and forests of spruce and fir prevailed in the region. Late Ice Age hunters probably followed animal herds into this area some 12,000-15,000 years ago. These nomadic Paleo-Indians camped in caves and rock shelters and left behind their distinctive arrowheads and spear points. They may have used such stone age tools to hunt the mastodon and caribou that ranged across eastern Tennessee. About 12,000 years ago, the region's climate began to warm and the predominant vegetation changed from conifer to our modern deciduous forest. Abundant acorns, hickory, chestnut and beech mast attracted large numbers of deer and elk. Warmer climate, the extinction of the large Ice Age mammals, and the spread of deciduous forests worked together to transform Indian society. During what is known as the Archaic period, descendants of the Paleo-Indians began to settle on river terraces, where they gathered wild plant food and shellfish in addition to hunting game. Sometime between 3,000 and 900 B.C., natives took the crucial step of cultivating edible plants such as squash and gourds - the first glimmerings of agriculture. Archaic Indians thereby ensured a dependable food supply and freed themselves from seasonal shortages of wild plant foods and game. With a more secure food supply, populations expanded rapidly and scattered bands combined to form larger villages. The next major stage of Tennessee pre-history, lasting almost 2,000 years, is known as the Woodland period. This era saw the introduction of pottery, the beginnings of settled farming communities, the construction of burial mounds and the growing stratification of Indian society. Native Americans in Tennessee made the transition from societies of hunters and gatherers to well-organized tribal, agricul- Early man hunted mastodon that roamed during the last Ice Age. The peak of prehistoric cultural development in Tennessee occurred during the Mississippian period (900-1,600 A.D.). Cultivation of new and improved strains of corn and beans fueled another large jump in population. An increase in territorial warfare and the erection of ceremonial temples and public structures attest to the growing role of chieftains and tribalism in Indian life. Elaborate pottery styles and an array of personal artifacts such as combs, pipes, and jewelry marked the complex society of these last prehistoric inhabitants of Tennessee. In their futile search for gold and silver, Hernando de Soto's band in 1541 and two later expeditions led by Juan Pardo encountered Native Americans. By introducing firearms and, above all, deadly Old World diseases, such contacts hastened the decline of these tribes and their replacement by other tribes, notably the Cherokee. 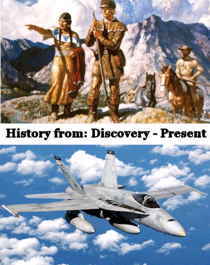 The advent of the gun brought about major changes in Native American hunting technique and warfare. Indians grew increasingly dependent on the colonial fur trade by supplying European traders with deer and beaver hides in exchange for guns, rum and manufactured articles. This dependence, in turn, eroded the Indians' traditional self-sufficient way of life and tied them ever closer to the fortunes of rival European powers. Woodland Indians first developed farming in Tennessee. Great Britain obtained the region following the French and Indian Wars in 1763. During 1784-87, the settlers formed the "state" of Franklin, which was disbanded when the region was allowed to send representatives to the North Carolina legislature. In 1790 Congress organized the territory south of the Ohio River, and Tennessee joined the Union in 1796. 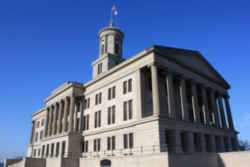 Although Tennessee joined the Confederacy during the Civil War, there was much pro-Union sentiment in the state, which was the scene of extensive military action.